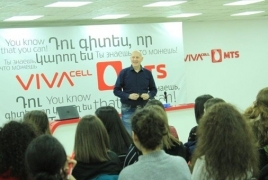 PanARMENIAN.Net - Paying particular attention to developing the culture of sales and customer care in the telecommunication sphere in Armenia, VivaCell-MTS has been implementing VivaStart educational program for the third consecutive year. Another group of “VivaStart” graduates received certificates of completion on Friday, November 9. Four of the participants, who had shown the highest results, Haykuhi Martikyan, Ani Karapetyan, Mariam Hakobyan and Arsen Hayryan got “Huawei Honor 7A” smartphones along with the certificates. This year, the 9th VivaStart program was held with participation of 36 students. Eight of them were actively engaged at the service centers located in Kentron administrative district and in Zvartnots airport during the Francophonie Summit. In the frames of VivaStart educational program, students were given the opportunity to gain theoretical knowledge in sales and customer service sphere and to turn that knowledge into practical skills through directly working with customers at VivaCell-MTS service centers operating in Yerevan and in different regions of Armenia. The awarding of certificates at VivaCell-MTS headquarters was preceded by a masterclass titled “Networking skills”. During the masterclass, the students learnt how to network effectively, which is one of the most important skills in the modern business world. They had an opportunity to ask the trainer questions and to present their ideas. After awarding the certificates to the graduates of VivaStart, Ralph Yirikian noted: “It is important that during the educational program you had an opportunity to get acquainted with the telecommunication sphere and tried to understand the key processes and stages in service provisioning and customer care. VivaStart program, which has been implemented by VivaCell-MTS for the third year in a row, has two objectives: developing the analytical thinking skills and sharing knowledge with students, and, finally yet importantly, preparing them for the job market. The acquired knowledge and skills will help you to start a professional career, in particular in the customer care sphere”. As noted by VivaCell-MTS General Manager Ralph Yirikian, VivaStart and similar programs organized by the Company, have a continuous nature. Since the start of the program in 2015, 254 students have participated in the program. A number of VivaStart graduates already use their professional knowledge and skills at different companies, including those in the telecommunication and adjacent sphere. 22 of the students, having shown the best results, have been employed at various VivaCell-MTS service centers. The Company always considers the opportunity of hiring graduates of the program in case there is a relevant vacant position.